There are several car loan places that can be used when buying a new or used vehicle, and AutoNet Financial is one of the premier auto finance centers to be used. 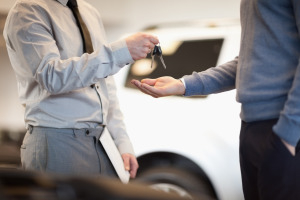 Our network allows for consumers with good, poor, and even bad credit to qualify for pre approved auto loans and be connected to a dealer that offers great rates. With that said, many people are curious to how any auto finance center conducts the lending process. That is why we choose to touch on what our specialist focus on, when deciding to approve a borrower for a loan. Many car buyers believe they can always get auto financing with dealers in their area, but that is not always the case. Certain car lots throughout North America are not as willing to offer poor credit loans, no money down financing, or any other special finance options to consumers, due to the uncertianty of payments being made on time. However, a vehicle loan center like us can use our extensive network to pair people with the best possible dealership that can finalize your loan. In order to match each applicant with the proper lender, we first have make sure they have the credit score needed for car loan approval from our credit center. By doing this we can immediately determine the likelihood of an applicant being guaranteed approval with a specific type of lender. For example, a person with good to perfect credit rating above 700 can essentially recieve quality auto financing from any car dealership. On the other hand, a person with subprime or bad credit will need to be guided to a lot the has a vehicle loan programs for people with scores below 600. These types of auto dealerships are more likely to offer an affordable loan on vehicles without the extra hassle that banks and credit unions tend to apply to people. One of the more important factors that most vehicle finance centers pay atttention to is an applicants debt-to-income ratio. Often times a person can have a very poor credit history, but still be approved for bad credit car loans simply because they can afford the rates that come with a specific car loan. In fact, a number of buyers can even get away with not making a down payment if their credit rating and monthly income is impressive enough. As a premier lender our main concern is that we offer financing to people who are sure to make timely payments on their loan. That is why we require customers to be employed and make at least $1500 a month before taxes, as it is more likely for anyone to land affordable finance rates with any credit type. It is also a good idea have funds for a down payment prepared in most cases. When you apply for financing online with our lending network you can feel comfortable in knowing that you're receiving the best loan rates for your situation. So, if you need help with getting a approved for a your car we can help you by way of our quick and easy finance application today.